drawing on a whiteboard, the organization structure. Before we proceed any further, we have to deal with the Accounting Setup Manager. The Accounting Setup Manager is a feature introduced in R12 that acts as a centralized setup tool for defining 3 critical entities in the multi org setup. These are the Legal Entity, the Primary Ledger (a.k.a. Set of Books in 11i) and the Operating Unit. In 11i, the Legal Entity, the Set of Books and the Operating Unit… all of these were defined using the Organizations form typically through the HRMS or Inventory responsibilities. The Accounting Setup Manager has changed all of that. 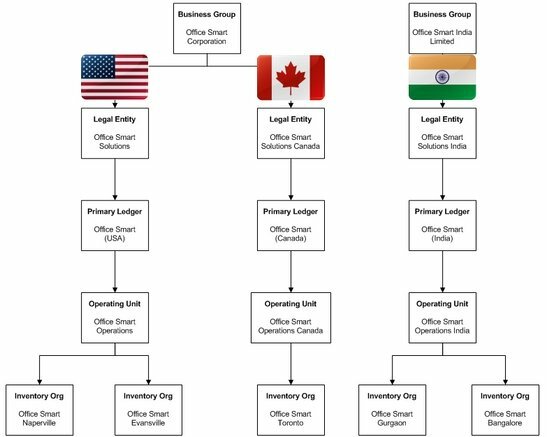 Let us review the Office Smart multi org structure. 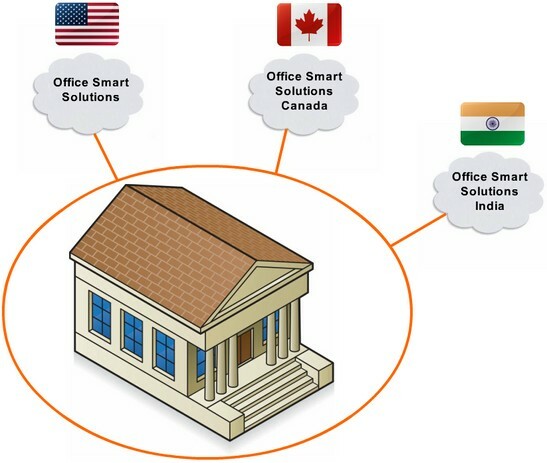 Office Smart has a Legal Entity in each of the 3 countries. A Legal Entity is the body of the business that interacts with country, state and local agencies and regulators for the purposes of taxation, financial reporting and regulatory compliance. In short, Legal Entities comply with whatever needs "compliance", hence the word "Legal". Therefore, the Legal Entities represent the business, as a registered company. Legal Entities create commercial transactions. We use the Accounting Setup Manager to create these 3 legal entities for Office Smart. 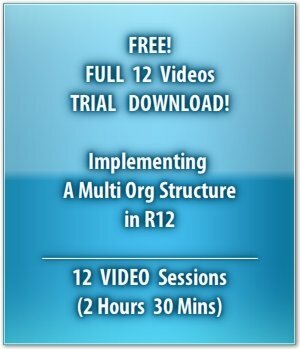 The video tutorial, "A Step by Step Guide, to Implementing a Multiple Organizations Setup, in Release 12", covers this in detail. A Legal Entity needs to be assigned an address, when is being defined in the Accounting Setup Manager, because it represents the business to regulatory authorities, as a registered company. In the multi org setup in oracle apps R12, if a new address is defined for the Legal Entity, then once the Legal Entity creation is complete, this address appears in the Locations definition form, as a "Legal Address". This flag cannot be updated in the Locations form. However, if we intend to select an existing address from the Locations form into the Accounting Setup Manager, when defining the Legal Entity, then we can only select locations that have the Legal Address flag enabled. A Location defined in the Locations for, will not have this flag enabled, and so cannot be used with a Legal Entity. That Location can however, be assigned to any other organizational entity. Having defined these 3 Legal Entities for Office Smart, we are ready to move to the next step.